The MAKE District is an addition to the Habersham Marketplace. MAKE is an acronym for Makers, Artisans, Knowledge and Enterprise. This area of the Marketplace will focus on attracting businesses in the craft manufacturing and knowledge industries. These types of businesses are becoming more common and generally have grown out of someone’s hobby or acquired skillset. Oftentimes, their business grows quickly and their need for more space becomes pressing. Typically, these entrepreneurs are people who enjoy community and prioritize quality of living. Finding a larger home for their growing business can be difficult because these folks do not want to be in industrial parks, off of highways, or in office parks even though that is mostly what is available. The MAKE District hopes to provide an alternative for these innovative and artistic entrepreneurs. Space will be available in buildings with larger footprints yet still have an urban presence on the street and are in walking distance to restaurants, businesses, homes and parks. They will also be surrounded by similar business concepts that can help foster and promote community and creativity. The vision for the MAKE District is to expand an existing urban town center with uses such as craft manufacturing and knowledge industries that will be within walking distance of 1,400 homes. MAKE is an acronym for Makers, Artisans, Knowledge, and Enterprises. Future MAKE District businesses will be made up of entrepreneurs who are innovative, artistic and have a desire to be a part of community. • Standard voltages are 120/240 Volt Single Phase. 3-Phase Power also available. Situated in the heart of the award-winning town of Habersham, the Marketplace benefits from the town’s growing population that filters through the Marketplace daily. Habersham’s projected population is well over 4,000 residents. Habersham Marketplace, which consists of a charming blend of neighborhood services, activity based retail, restaurants, cafes and gift shops also draws upon the 200,000 people living within 30 minutes. Currently, what is built, is 25,000 square feet of ground floor retail, which is made up of a proper mix and placement of quality and unique commercial concepts that mutually benefit each other’s business endeavors. In addition, the business owners are part of a Merchants Council that collectively promotes the Marketplace through advertising, hosting events, and making capital improvements to the streetscape. As a result of this collective effort, the Marketplace is becoming more and more a magical place to experience and regularly host first class events drawing thousands of people and attracting partnerships with Southern Living Magazine, Beaufort Chamber of Commerce, Riverview Charter School, Lowcountry Food Bank and other notable organizations. From the beginning, the Marketplace has set out to become a commercial destination for Beaufortonians, where locals can come and know they will have a quality experience. Habersham is just north of the Broad River in Beaufort County, 7 miles from historic downtown Beaufort. Its location is equidistant between the 2 main highways leading south to Savannah (45 minutes via Hwy 170) and north to Charleston (70 minutes via Highway 21/17). The town plan, by Duany Plater-Zyberk, is based on the architectural charm that is reminiscent of neighboring cities such as Charleston, South Carolina and Savannah, Georgia. Lovely streetscapes and traditional southern architecture encourage homeowners to build relationships within Habersham as they stroll along the neighborhood’s quiet oak-lined streets, scenic woodlands, footbridges, walking trails and waterfront parks. With an array of activities, residents enjoy greeting neighbors at the town’s Post Office, gathering with friends at the corner cafe, spending the day at a pool located on one of the connected sea islands, catching shrimp from one of the neighborhood’s docks or lounging in one of Habersham’s parks under ancient live oaks. Habersham development is led by the Habersham Land Company, a private development group who has been working in Beaufort County for 25 years. Habersham currently has over 400 built residential units and 25,000 square feet of retail commercial, and at build out, is zoned for 1,477 residential units and 150,000 more square feet of commercial. Habersham has become a national model for traditional town building and won numerous awards over the past 15 years, including being named the Best Neighborhood in America by the National Home Builders Association and chosen as one of the first Southern Living Inspired Communities. Locally, its been repeatedly voted as the Best Neighborhood in Beaufort and has served as a model to look at for Beaufort County’s newly adopted form-based code. As Habersham continues to be developed, it further proves itself as a sustainable development pattern for living, working and playing. The South Carolina Lowcountry is a term used to describe the state’s coastal counties, generally south of and including, Charleston. The Sea Islands and parts of coastal Georgia, including Savannah, are often grouped into this distinction. Over 2 million visitors each year visit the region’s major cities of Charleston, Beaufort, Hilton Head Island and Savannah. The Hilton Head Island-Bluffton-Beaufort Metropolitan Statistical Area (MSA), which includes Beaufort and Jasper counties, is located in the Lowcountry and had a total population of 198,467 in 2013 (U.S. Census Bureau estimate). The population included in this metropolitan area was 64% urban and 36% rural. It included the urban clusters of Beaufort (48,807), Hilton Head Island (68,998), and Ridgeland (5,301). From 2013 to 2014, the US Census Bureau ranked this MSA the 13th fastest growing metro area in the country, four spots ahead of nearby Charleston. 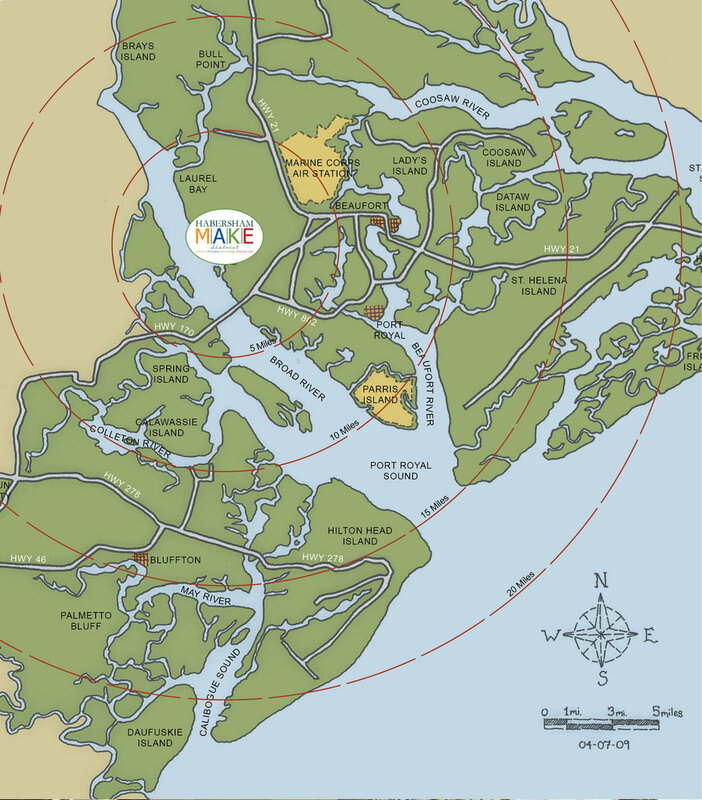 The City of Beaufort is the center of an urban cluster comprising the city and its surrounding towns and unincorporated areas including Port Royal, Burton, Lady’s Island, Shell Point, Laurel Bay and Parris Island, among others. The city is located about 70 miles south of Charleston and 40 miles north of Savannah, GA. The population in Beaufort offers a diverse mix of military personnel in the immediate vicinity. Laurel Bay, the Marine Corps Air Station, the Beaufort Naval Hospital and Parris Island are all major military bases within Beaufort. Taken together, the military bases of greater Beaufort account for a population of over 17,000 service men, women and families. Beaufort also features a University of South Carolina campus and Technical College of the Lowcountry that introduces a student culture to the area. USCB has an average enrollment of 1,500 students while TCL has a student population of over 2,000. Beaufort is one of the few towns with its entire downtown designated by the National Trust for Historic Preservation as a historic district. The town was filled with mansions built by the wealthy plantation owners before the Civil War. It was one of the only Southern towns occupied by Union troops, rather than destroyed during the war. More than 50 historic structures have been identified and include many lovely private homes beautifully restored and enjoyable on tour by professional guides, either walking or via horse-drawn carriage or bus. Spring and fall events offer special opportunities for visitors to tour several private homes and gardens. Art galleries, antique shops and modern boutiques are also within the downtown walking area, not to mention fine dining and quick eateries. The moderate climate hosts outdoor relaxation for meals or park enjoyment year-round. South Carolina ranked #1 as America’s Happiest Seaside Towns by readers of Coastal Living Magazine.